I was watching this snowy owl (who seemed undisturbed by other people walking by) for a while when some dogs had startled her. The owl majestically flew away from the dogs, and I managed to track most of her flight with my camera. 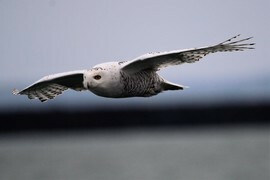 This was perhaps the best ever snowy owl encounter I could ever have.